Hungry Hen eats and eats and grows fatter and fatter. High on the hill a hungry fox watches, and grows thinner and thinner. One day he can stand it no longer. What do you think happens? Well – it’s not what you think! This bright and funny picture book is firmly established as a modern classic, with its simple story and brilliant twist at the end. Really easy to read, with vibrant pictures too: sheer storytime delight. Caroline Jayne Church is an award-winning author and illustrator renowned for her many picture books, including Harriet Dancing and Leaf Trouble. She was born in 1963 and lives in Farnham, Surrey. Having grown up in Oxfordshire, she later went to college in London to study Graphic Design. 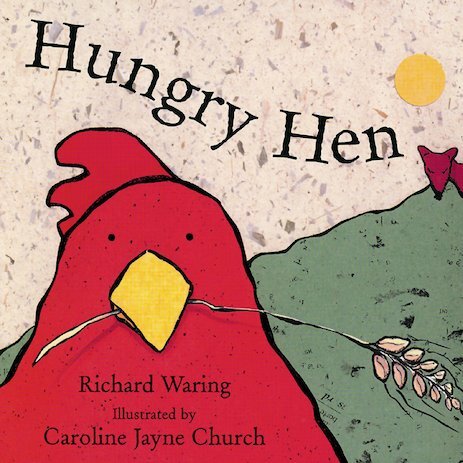 Her book Hungry Hen was short listed for the Kate Greenaway Medal in 2002, the same year it was ranked among the top five best selling books in the UK. In 2005, I Love You Through and Through won the Oppenheim Toy Portfolio Best Book Award and in 2006 Little Lost Cowboy received the Royal Mail Scottish Booktrust Award.